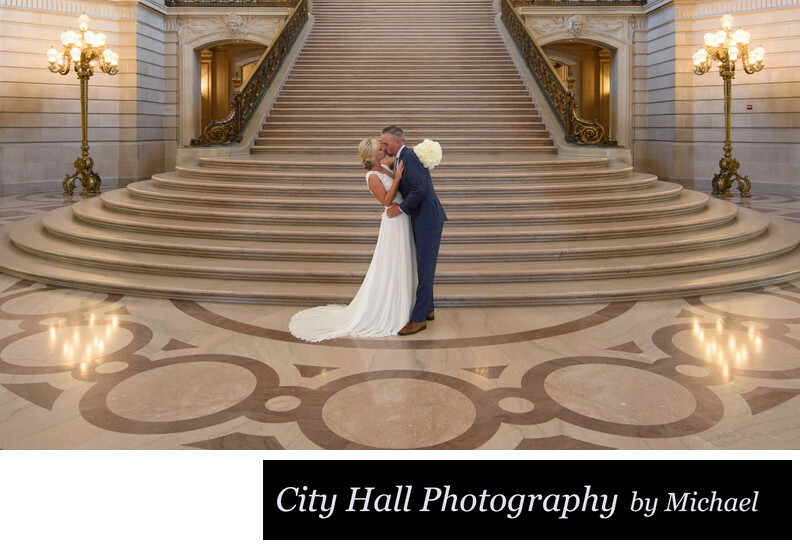 There is a multitude of information on San Francisco City Hall wedding photography websites regarding what steps are needed to reserve and book a civil ceremony. Most of the information I have seen is very general in nature and offers few details. In fact, even the city hall website itself can be hard to negotiate. This guide will provide you with Step-by-Step detailed procedures regarding how to get married at San Francisco City Hall. We will also include helpful links and relevant costs where possible. Fees and Reservation Pricing - The cost for the marriage license is $108. To have your ceremony in one of the standard areas costs $81. The standard ceremonies can be performed in the beautiful Rotunda area or the newly redecorated Private room. If you prefer a private ceremony you can book either the Mayor's Balcony or the 4th floor Gallery for $1,000 for a 1 hour time slot. It is hard to go wrong with any location in this historic building. The reserved areas will provide you with an added amount of privacy and prevent tourists from walking through your ceremony. Mayor's Balcony and 4th Floor Locations - As mentioned above, you also have the option of having your ceremony in these 2 beautiful City Hall locations. You can book either of these locations 1 year in advance. The advantage of paying the additional money is that you get a roped off, private ceremony with chairs set up. You can also have a much larger guest list. Remember that the standard city hall ceremony only allows for 6 additional guests. Despite this particular rule not being strictly enforced, large groups cannot be accommodated in the Rotunda so you may want to consider this option! 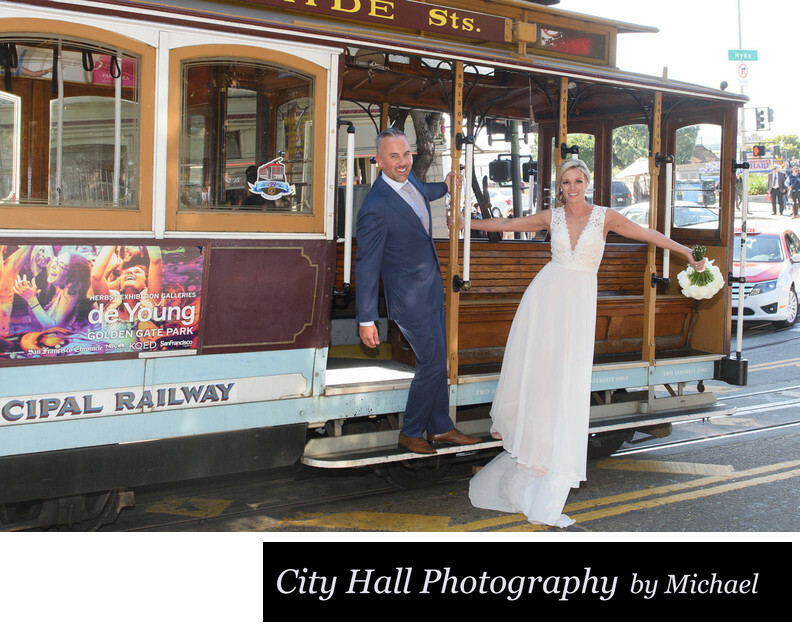 Saturday Weddings at SF City Hall - You can also get married on a Saturday at City Hall! They have different packages, but by far the most popular is the 2 hour package for $5,000. For your money, you basically get the whole building to yourself since San Francisco City Hall is closed on weekends. They restrict you to a few floors, but there are plenty of great areas to photograph your wedding even with the limitations. For more information and booking details you can click on The City Hall Event Website. You can also get married in the evening at City Hall. The building remains open, but they will privatize your ceremony location. For more info click here. Can I Get a Witness? - What's all this talk about witnesses and when and why do we need them? By law you must have your marriage license and ceremony witnessed in order for it be a valid and legal union. The exception to this is if you decide to obtain a Confidential Marriage License. Rather than going into long detail about how this works, please check out this information on the city hall website that will allow you to apply for this type of license. Assuming you are not obtaining nor qualify for a confidential license you will need to have at least 1 witness with you during the ceremony. This same witness must also accompany you to your ceremony check-in to sign the document. Lastly, this witness needs to actually watch the ceremony occur. If you don't have anyone with you we (your photographer) will be happy to act as your witness. We do it all of the time for our clients and are honored to do it. Rules and Regulations - City Hall is very strict about their reservation policy so cancellations are not allowed. They will allow you to reschedule with enough notice. If you lose your license or mess it up, you will need to pay the fee all over again to get a new one. Please also warn your witness to be careful signing the marriage license so they don't make a mistake. Scratch offs and/or white out is not allowed and invalidates the license. Once you receive your license you have 90 days to get married.